Header button label:HISS LESSONS & RENTALS Sheet!HISS LESSONS & RENTALS Sheet! 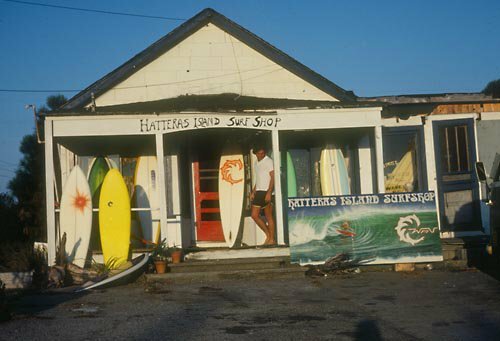 In 1971 Barton Decker and a few of his friends came down to Hatteras to open a Surf Shop in the quiet town of Waves, NC. At the time there wasn't much there, only 25 mailboxes for residents at the post office. They came to surf and spend their summer away from home in what they considered paradise. What was going to be just a few summers turned into over 40 years. We have broadened our horizons over the years and fell in love with Windsurfing, Kiting, and Paddleboarding. Though a lot has changed since then, there is at least one thing that hasn't: our love for the water and our passion for these sports. We are lucky enough to work spreading the stoke of Surfing, Kiting, Windsurfing, SUP to others through lessons and providing people with quality gear. It is a way of life that allows us to connect with great people doing what we love! We have a whole lot of fun gear!